Registration for the next NCSM Fall Seminar in Seattle is still open! If you have only one day to spare for your professional growth, consider spending that one day with NCSM in Seattle, WA on November 28th at the Renaissance Seattle Hotel, 515 Madison Street. The NCSM leadership seminar will have a theme around Building Mathematics Leaders: Coaching. The focus will be to help each participant become the agent of change and improve student achievement in mathematics through the vehicle of classroom and district coaching. Other benefits of attending this professional learning opportunity include learning about research-based strategies using expert resources in mathematics coaching; networking with leaders from other regions, states, and countries; and developing a plan for yourself or your district to focus your mathematics leadership in coaching. Registration for the Seattle Fall Seminar (November 28) can be accessed by clicking HERE. Online Registration closes November 23, 2018. Onsite Registration will be available for Member $125 and Non-Member $175. More general details about the seminars' program, flyers, and logistics are available by clicking HERE. NCSM is a volunteer organization. We love our volunteers and need our volunteers. Consider volunteering for NCSM not only at the annual conference but in other ways as well. Click HERE to see all the ways you can be involved and to sign up to volunteer. We thank you in advance for checking out our volunteer opportunities! The Conference Board of the Mathematical Sciences (CBMS), the umbrella organization for the professional societies in the mathematical sciences, working in collaboration with the Charles A. Dana Center at the University of Texas, Austin and Achieve, will be holding a Forum to initiate a multi-state effort directed at bridging the gaps between high school and college mathematics. The Forum will be held at the Hyatt Regency, Reston, VA, convenient to both Washington, DC and Dulles airports. It will begin at 5 pm on Sunday, May 5 and conclude at 3:30 pm on Tuesday, May 7. It will offer a mix of plenary speakers and panelists as well as breakout sessions where participants can receive advice and support from policy experts at the Dana Center and engage with representatives of the CBMS societies around their recent reports and recommendations. The Forum is designed to develop and support state-based task forces working to coordinate efforts across grades 11–14. The goal is to help states create policies and practices for mathematics instruction that contribute to successful completion without reducing quality. To be truly effective, such a task force will need to be representative of all interests across the state including business and industry as well as those who shape educational policy and those who implement it at both high school and post-secondary levels, including both two- and four-year institutions. The full task force will probably have twenty or more members. The Forum is intended to work with a smaller team of six to eight individuals who will provide the leadership for the task force. Teams are asked to apply to participate in the Forum. Full application forms will be due by November 1, 2018, with notice of acceptance sent in early December. Application forms and full details on the Forum can be found by clicking HERE. The day before the Forum, Saturday, May 4, 2019, is the biennial National Math Festival, held at the Washington, DC, Convention Center. Those coming to the Forum are strongly encouraged to take in this day of mathematics for all. More information on this event can be found by clicking HERE. Continue to tune into the activites for the Collective Call to Action - Equity and Social Justice in Mathematics Education: From Awareness to Action. The next discussion forum for September/October will culminate with a webinar in November 2018 (date TBD). When I began teaching, I was the only mathematics teacher in the high school. I taught five different courses and felt isolated in my classroom. Professional development in my school was never discipline-specific and I did not believe I could leave my students to go somewhere else for much needed professional learning. I was so wrong! Years went by and my growth was limited. Eventually I had the opportunity to attend a professional learning seminar. I gained so much and most importantly, my students learned more as I grew professionally. Early this month NCSM hosted a Fall Leadership seminar in Hartford, Connecticut for coaching leadership. Read some of the comments from participants. 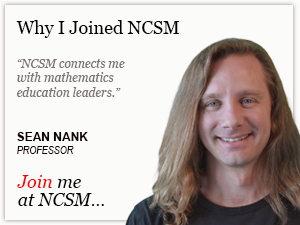 "If you are looking to spend a day with other coaches, to network, brainstorm and problem solve issues specific to supporting math teachers, you need to attend NCSM!" -Kathy B. "The tools are great! I feel confident that I can go back and implement them with staff and they will help us more toward more effective math instruction in our building." -Tracey C.
"Learning, practicing, validating, reflecting, growing and networking… The day supported my growth as a coach and leader of mathematics education." -Sue D.
"Excellent presenters. I will use each activity in my work and share with the coaches I work with. Resources are excellent. Thank you for an extremely productive day. I wish more of the coaches I work with would have been able to attend. They missed out on a day filled with great insights." -Suzanne L.
There is another similar NCSM professional learning opportunity this fall in Seattle on November 28th. The same theme as in Hartford around Building Mathematics Leaders: Coaching will be the theme in Seattle. Coaches support teachers and other mathematics leaders so that they have the opportunity to learn. Keeping in mind – effective learning for each and every learner. Join us in Seattle so that you can grow professionally with other mathematics leaders. More general details about the seminar's program, flyer, and logistics in Seattle are available by clicking HERE. Also see the blurb on the left for specific details. There are other professional learning opportunities for mathematics leaders on the horizon cumulinating with our 51st Annual Meeting in San Diego, April 1-3. Make plans to join us for your professional learning growth as we Make Waves in San Diego! See the article below for additional information. Registration Is Now Open for the 2019 NCSM Annual Conference in San Diego on April 1-3! The six strands for the 2019 NCSM Annual Conference represent areas of interest to a large number of our members and we hope that by focusing on these topics you will learn deeply about issues that are of immediate and lasting importance to you. Conference details and logistics are available by clicking HERE. 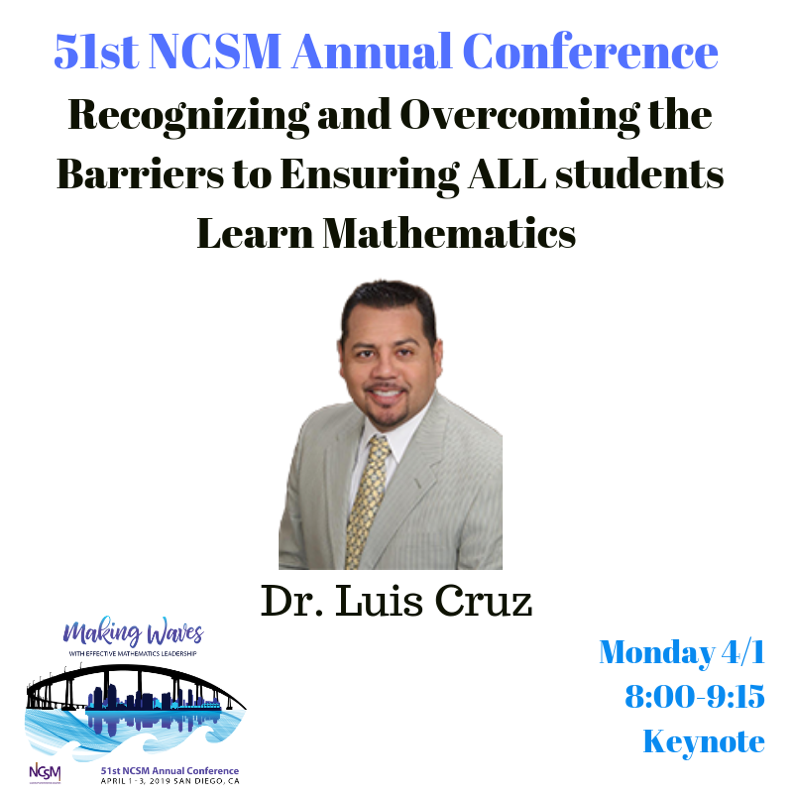 Here is a teaser for our Monday keynote speaker (4/1/19, 8:00am-9:15am), Dr. Luis Cruz. It is going to be good...! Nominations for the Kay Gilliland Equity Lecture Award closed on October 1, 2018. The following NCSM awards are currently opened for nominations. Please note the deadline for each award or grant. One of the member benefits is access to the quarterly NCSM Newsletter. The Fall Issue of the Newsletter is currently posted to the NCSM website. Click HERE to access the current issue online or click on the image of Fall 2018 NCSM Newsletter below. This issue features highlights of our 50th Annual Conference and includes articles about developing common vision, resources for coaching, and the second installment of the Women of Color in Mathematics series. There are several components of our online newsletter flipbook reader we want to highlight. As you turn each page, all active weblinks are briefly highlighted to draw your attention. The arrow at the bottom edge of the screen opens up thumbnails of the pages, allowing you to jump to a desired section. The arrow at the top edge of the screen opens a menu of options including settings, bookmarks and search features. 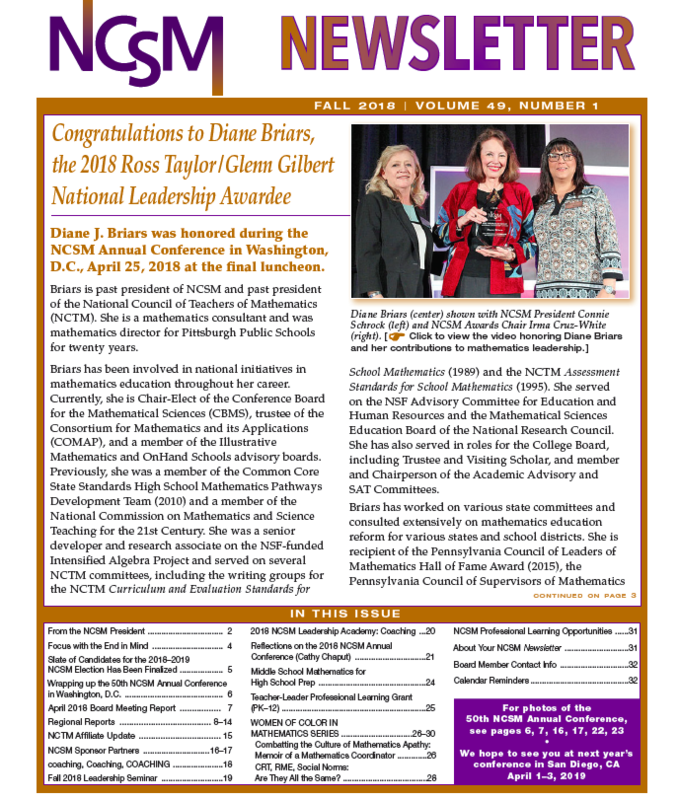 Archived issues of the NCSM Newsletter are available HERE. NCSM is excited about this online access to our newsletter and hope you are enjoy it as well!